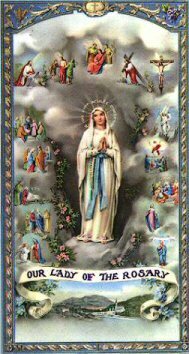 Our Lady of the Rosary Library "Store"
We offer many good traditional Catholic Religious items at low prices to encourage, promote and defend the Catholic Faith! Our online Store is set up for "Mail Order" only. Please print the last page at checkout and mail with your payment (no credit cards). All shipping addresses must be in the USA or one of its provinces (i.e., Guam, Puerto Rico and the US Virgin Islands). Our Lady of the Rosary Library has been in existence for over 30 years. Our purpose is to promote the greater honor and glory of Our Dear Savior and the salvation of souls. The Library is a non-profit family apostolate. We offer our material at very low prices to encourage widespread distribution. Please read the "five easy steps for ordering" in the Ordering Guide below! 1) Select "Product List" (link in top bar) which shows all the items we offer. Click on "Search" if you cannot find an item. 2) Click the button for each item you want to purchase (click on the "Product Code" if you want a description of the item). 3) Select "Basket Contents" (top bar) and enter the quantities you want of the items you selected (you can remove items there also). 4) Select "Checkout" (top bar) and "Login" (if you have already created an account), or click on "Create New Account"* or "Place Order Without Account" then click "Save" or "Continue" after completing the required information. 5) Select the desired shipping method, click "Continue" then print 2 copies of the next page and mail one with payment (address provided - background color will not print). Orders are usually mailed out the day after we receive them. *Creating an account at checkout will retain your name and address information and facilitate future orders and also enable you to return to the store during checkout without losing this information. Enter any word (no spaces) for "Login" and "Password". Items marked "+++" have quantity purchase discounts (click product "Code" for details). The Store will automatically calculate the discount. Please honor the limits we have listed on various items. The Store does not recognize these limits. We are not a wholesaler and reserve the right to refuse sales to dealers. If you have any questions, comments or suggestions please send us an email or give us a call. Please do not let the religious items you purchase remain idle; distribute them at churches and to friends, relations and strangers. Let us sow the seed and pray that Our Dear Lord will see that our efforts bear good fruit through the intercession of His Holy Mother.